Someone in Slotsland has a hard-on for Simon Cowell projects, it seems. The British TV icon has had several of his shows turned into online slots, most notably Ash Gaming's TV-themed X Factor and X Factor Jackpot from the same developer. 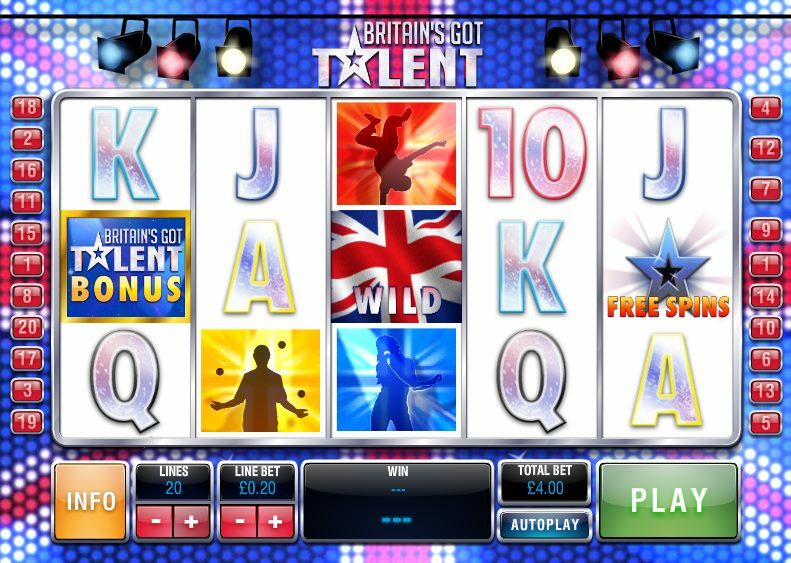 Now, from slot developer, Ash Gaming, comes a slot based on the summer TV ever-present: Britain's Got Talent. You know the show - the one packed with the "cream" of amateur variety talent trying to impress the four judges and bag the crown for being the UK's best (or most deluded) sword swallower/opera singer/ventriloquist/break dancer. Actually, that list might be doing the show a bit of justice. If my memory serves me right, a dog won it the year before last so that sums up the pool of talent Britain holds! Britain's Got Talent is a 5-reel, 20 payline slot and the betting is all-inclusive - a little like the audiences for one of Cowell's shows - which caters for wallets of every size. Coins range from $0.01 to $50. In terms of symbols, there are plenty of classic icons that fit over the glitzy backdrop of a Union Jack: a juggler, a breakdancer, a singer, some standard gameshow-style card symbols, and the Union Jack acting as its own icon. The Wild is also the Union Jack and substitutes for all regular symbols in the game other than the Scatters. 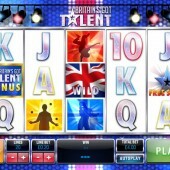 There are two bonuses in the game, the first triggered by hitting three Britain's Got Talent icons on Reels 1, 3 and 5. Similar to the kind of Trail Bonuses you find in one of the other X Factor slots, the bonus gets you to select a musical act, novelty act or dance act to represent you. Then, work your way through the Audition process, the Semis and the Final to see if your act can lift the trophy and bag that spot at the Royal Variety Performance. A more standard free spins round is triggered if you hit three Free Spins Scatters on Reels 2, 3 and 5. After you trigger the round, the free spins icons will spin round to reveal a spin number. These are then totted up to determine your spins total (anything from 7 to 20). However, look out for the BGT logo before the spins start; this will zoom across the screen and land on up to five spots to give you extra Wilds. In terms of playability, BGT is virtually identical to some of the other X Factor slots games doing the rounds. It might not have dated as badly as several of those games (although, to be fair, who remembers who's been on the show, and in what year?) but they're worth checking out all the same.